The Chinese government is pulling out all the stops to make sure the official party line on the Tiananmen Square killings is the only one heard in China. Besides the usual heavy-handed directives from Beijing to all media outlets on what to say and what not to say, the government has also moved against the Internet community in China, known as Netizens. And while the rest of the world will be looking back at what happened then, the government leaders will just keep on doing “business as usual” rather than deal with the wound created 25 years ago. And I should add that the ONLY place under Beijing rule that is allowed to openly discuss what happened at Tiananmen Square and is able to have demonstrations calling for a full investigation into what happened is Hong Kong. And here is the famous “Tank Man” who stood up to the Chinese tanks heading to the square. The value of TOR is that its encrypts data that allows human rights activists and journalists to get around the censorship and monitoring of dictatorships. It is such a robust piece of encryption software that even the NSA has been unable to crack it. IFEX interviewed Andrew Lewman, Executive Director of the TOR Project. Two prominent activists in the eastern city of Hangzhou have been taken into police custody since Friday for attempting to draw attention to the military crackdown on June 4, 1989 during which more than 200 protesters are believed to have died. Each year the security police round up anyone who has called for an accounting of the government’s action in Tiananmen Square in 1989. I watched it in action during my time in Shanghai (1992-1994). Our phone lines suddenly had more static and some lines, like those for Western reporters, temporarily “had difficulties.” Extra “security” put in front of the Western consulates and housing enclaves of Western diplomats and businessmen. Things have not changed since then. And thanks to China Digital Times for pointing the latest outrage. Russian president Vladimir V. Putin signed a new law into effect that requires bloggers to register with the government. The new law states that any blog site with more than 3,000 followers is the same as a newspaper or broadcast outlet, and thus, is required to register with the state. The law also bans anonymous bloggers. Sometimes the government officials in China — from the national to the local levels — just make it too easy to find more and more reasons why censorship doesn’t work. Second, eventually the information gets out. And so we have the fun case of the deputy chief of the Internet team at the Haikou City Public Security Department who was caught accepting bribes and got 10 years in prison. It seems he used his authority to censor the Internet to make sure any references to his own corrupt activities were deleted from chat rooms and blogs. What is the Price of Press Censorship? The fact that Chinese media don’t dare report is that in the larger context of corruption within the propaganda regime, these web police are actually insignificant. The golden goose is the propaganda department and its local branches. The propaganda department controls not just the internet, but also newspapers, television and book publishing. It has not just the power to order the deletion of web posts, but can also tell all of the media under its shadow what needs to be reported. Moreover, the propaganda department also controls personnel issues for the vast majority of media. It can order the punishment of media staff, remove publishers or editors in chief, and even tell media to fire journalists. Many local propaganda departments even have the power to impose economic sanctions on media. Once again many thanks to the China Media Project for bringing details of this case forward. 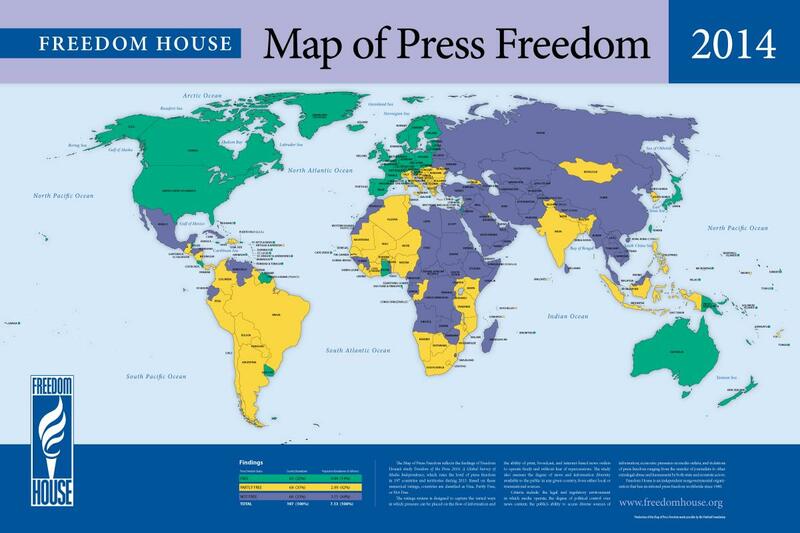 Freedom House released its 2014 Press Freedom Report today. And the news is not good for lovers of free and independent media. The decline was driven in part by major regression in several Middle Eastern states, including Egypt, Libya, and Jordan; marked setbacks in Turkey, Ukraine, and a number of countries in East Africa; and deterioration in the relatively open media environment of the United States.